: Workshop, Community&Reaserch project, Education program, Da Vinci Idea, Expert support program, Open studio and exhibition and etc. room and kitchen and etc. a Portfolio(File by ppt or pdf), a copy of passport. ※ Artists applying for the category of undertaking the Community&Research Project from October through December 2014 must complete and submit their work proposal and portfolio formatted as appropriate for the concerning project. "Community art" as defined and sponsored by Seoul Art Space Geumcheon is a form of activity possessing a significance beyond an individual's artistic achievements, finds entrance into a locality but is not premised on any aims of specifically contributing to the region, and includes the instances of a formation of ephemeral relational networks, archiving and instances adopting "the local" as their aesthetic subject matter, etc., none of which are premised on any collaboration with a community. However, such activities are ultimately aimed at contributing to the cultural bases of local communities. 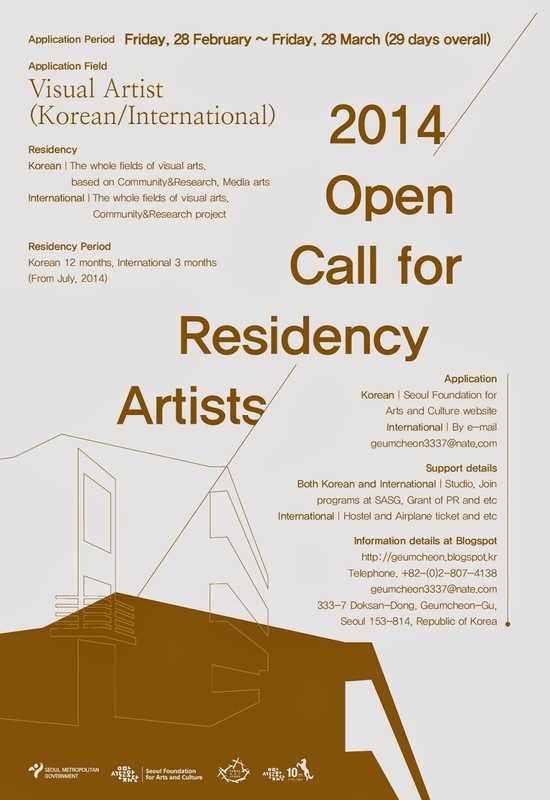 The physical range and issues of the Research Project Seoul Art Space Geumcheon sponsors is to be limited to the Seoul area. ※ 2nd review is for candidates passed through 1st review, and International artists are free to be reviewed by the presentation.